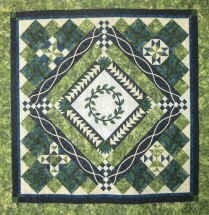 New to quilt making? Or maybe you just need a refresher. 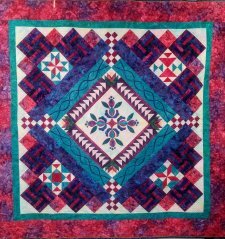 Start from the beginning with Nancy's "Learning to Quilt" series. Get all the basics plus lots of extras. You will learn proper accurate rotary cutting, the importance of the scant 1/4" seam, strip piecing, triangles, flying geese, bias cable work, paper piecing, invisible machine and hand applique..........just to name of few of the techniques. Sign up early so that you can have a one on one session with the teacher to help you pick out your fabrics before the class starts. All remaining tools will be discussed in class before the next session. The teacher would be happy to meet with you before class to help you pick out and coordinate your fabrics. If you decide to choose your own fabrics, this is what you will need. The fabric yardage shown below should give you plenty of fabric to make this quilt and a little to spare just in case you have a miss cut to two. For a quick lesson on how I pick out fabrics using a multi-color focus fabric, please see our tour to a quilt shop on www.onpoint-tv.com Episode 107.